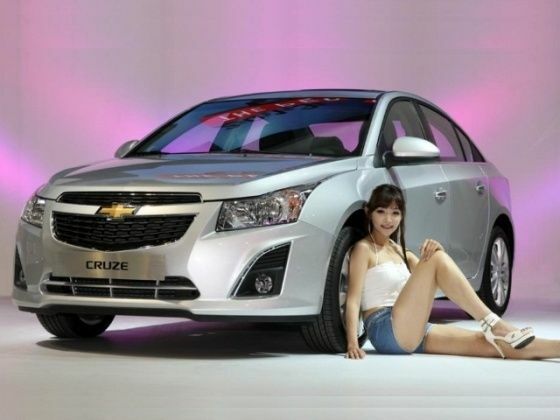 Chevrolet has taken the wraps off the much awaited face-lifted Cruze at the 2012 Busan Motor Show in South Korea. Styling changes include a redesigned front bumper with horizontal slats on the grille, bumper sporting a bigger air intake, triangular fog lamp housings and new alloy wheels. On the inside, there are restyled air vents, a more comfortable rear seat, and 7-inch MyLink infotainment system with a high resolution touch screen display that lets you play movies, music and browse photos from a USB drive. The face-lifted Cruze is the first Chevrolet in South Korea to feature the MyLink infotainment system. The car is also likely to get a new audio unit. Under the bonnet, the 2.0-litre VCDi engine has been retuned to churn out 163PS of power and 357Nm of torque. (The current Chevrolet Cruze in India develops 150PS of power and 323Nm of torque.) Turbo boost pressure has been raised from 2 bar to 2.2 bar, this should bring down the 0-100km/h time of 9.6 seconds further. The updated Chevy Cruze is rumoured to hit the Indian market by the July 2012.